Electric panel heaters provide instant, controllable heat and are suitable for almost any room. We offer a wide range of wall mounted or freestanding panel heaters, from the more basic models that can be used temporarily to more advanced models with thermostats and timers for those that require a more permanent solution. If you would like to discuss your requirements further, please call us on 01473 276686 and one of our team will be happy to assist. Our products are are stylish, slim and occupy minimum wall space and are perfect for small rooms such as bedrooms, studies, conservatories and loft conversions and for rooms used less frequently. All of our manual and timer versions have an adjustable thermostat offering a wide temperature range including a frost protection setting of 5°c. For maximum safety there is a thermal cut-out on all models to prevent overheating, should the outlet grille be accidentally covered. They work by heating the air that is in the room. It starts by passing the cool air through the heater, as it starts to get warm, the hot air comes out and then rises, pushing the the cooler air down. This creates what is known as a convection heating cycle, where the cooler air in the room sinks, goes through the heater and then rises when it gets warm until all of the air in the room is heated and a constant temperature has been achieved. Due to the way that they work, they aren't considered to be the most efficient way of heating rooms. As the hot air will naturally move to colder areas, it can be lost quickly through any draughts such as doors, windows or poorly insulated rooms. As the method of heating used is convection, this means that as soon as the heater is turned off, the air starts to cool and the warmth will be lost. Electric radiators do not suffer with this problem and they combine the speed of the convection method as well as radiant heat which keeps the rooms warmer for a longer period of time. They do not have to be expensive to run. The amount of energy used will depend on how large and cold the room is. 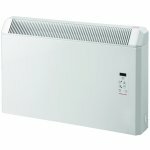 Just like any product used during the daytime, these heaters will use normal rate electricity, however, our range features highly accurate thermostats to help reduce running costs by avoiding over-heating a space. To reduce costs even further, we also have a number of thermostats and timers with advanced timers for even greater temperature control and economy, enabling you to match the heating to your occupancy for maximum comfort at minimum cost. Please see the individual product pages for more detailed information. You are looking to heat a room for only a short period of time, such as a utility rooms or a conservatory. You require a heater to back up your main heating system. This can be anything from backing up storage heaters that are frequently running out of charge, or larger rooms that do not have sufficient heating to heat the whole room. You need heating for a room that you only use occasionally, such as a home office or a spare bedroom. Some will come with a plug installed and some don't, such as Dimplex panel heaters. However, as long as the heater is under 3kW (which most are) you can purchase a plug and fit it yourself if you are comfortable in doing so. Most will also come with brackets to allow for DIY installation and can be done in minutes if you are happy to do so. If you want your panel heater to be hard wired, then you would need to employ the services of a qualified electrician. Example: Dimplex PLX075E is 750W and is 230V, as are most products used in the UK, therefore, 750/230 = 3.3. In this case, we would suggest using a 5 amp fuse. We would not recommend the use of them in bathrooms, as hanging towels or other items over the appliance can obstruct the ventilation and cause a fire hazard. We would recommend that you use a heated towel rail instead, as these are perfectly suited to heating bathrooms as well as drying towels. If you are still unsure and would like further guidance, please call us on 01473 276686 and one of our technical team will be happy to assist you. Alternatively, feel free to browse through our articles. Good value electric radiators, which do their job to specification, very easy to fit, look good, and keep us warm. Will be buying another soon for the hallway. No hesitation in recommending. Thank you very much for the great review of our service and advice.